Spinal cord injury is devastating to the individual. It results in a permanent cutting off the muscles of the body from the central nervous system and as a result paralysis. The severity of the paralysis depends on the location of the injury of the spine with the higher the injury the more widespread the paralysis. Worldwide there are approximately 375,000 people with a spinal cord injury. In the U.S. there are 17,000 new cases of spinal cord injury each year. Spinal cord injuries not only produce paralysis but reduce productivity and life expectancy. Indeed, people with spinal cord injuries have lower rates of school enrollment and economic participation and are two to five times more likely to die prematurely. Beyond, the devastating physical consequences of spinal cord injury are difficult psychological, behavioral, emotional, and social issues. The vast majority of patients experience chronic pain and a decreased quality of life. In addition, depression and anxiety disorders are common. Since, spinal cord injury is permanent, it is important to address the pain and psychosocial consequences of the injury that may be present throughout the lifetime. These can be changed and can help the victim engage in a happier and more productive life. Mindfulness training may help. It has shown to be effective in reducing chronic pain, treat depression and anxiety disorders, and improve quality of life following a variety of diseases. Tai Chi practice includes mindfulness training and also gentle physical exercise which may also be beneficial for patients with limited mobility. Hence, it would seem reasonable to examine the ability of Tai Chi practice in treating the psychological consequences of spinal cord injury. https://www.ncbi.nlm.nih.gov/pmc/articles/PMC5073764/, Shem and colleagues recruited participants with spinal cord injuries who had at least ability to move their arms and provided them with seated Tai Chi practice, once a week, for 90 minutes, for 12 weeks. They were strongly encouraged to practice at home with supplied videos. At the beginning and end of the 12-week training period they completed measures of pain, fatigue and depression. Throughout training, at the beginning and end of each weekly session they reported on their levels of pain, emotional well-being, physical, well-being, mental distraction, and spiritual connection. Unfortunately, 60% of the participants dropped out for a variety of reasons before the completion of training, many due to the time required to commute to and attend training sessions. This seriously calls into question the tolerability of Tai Chi practice for patients with spinal cord injuries. Of those who completed training they reported after each session lower levels of pain and mental distraction, and increased levels of emotional well-being, physical, well-being, and spiritual connection. But, over the 12 weeks of training there was no significant improvements in pain, fatigue, or depression. Hence, there was some immediate benefits of Tai Chi practice, but no discernable long-term impact. These are very disappointing findings that suggest that Tai Chi practice may not be the best treatment option for patients with spinal cord injuries. In a previous study, it was demonstrated that yoga practice improved the psychological well-being of for patients with spinal cord injuries and may be a better alternative treatment. Regardless, Tai Chi practice merits further study to determine if it can be of benefit to these patients when training is provided more conveniently. Previous research studies have confirmed therapeutic physical and psychological benefits of Tai Chi for both the able-bodied and disabled populations. However, given the limited availability of seated Tai Chi, there have not been any studies to date that have examined the effectiveness of seated Tai Chi in individuals with spinal cord disorder (SCD). We designed a customized seated Tai Chi program to meet the need for improved exercise options for individuals with SCD. 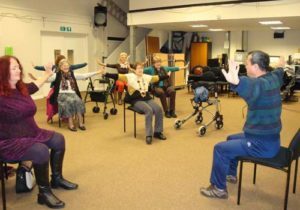 Twenty-six participants were enrolled in a 12-week seated Tai Chi course consisting of weekly sessions. After each Tai Chi session, patients reported improved visual analog scale (VAS) monitoring pain (P) (3.18 v 2.93; P 1.63E-03), emotional sense of well-being (EWB) (2.61 vs 2.04; P 2.86E-07), mental distraction (MD) (3.13 v 2.29; P 9.36E-08), physical sense of well-being (PWB) (2.84 v 2.25; p 7.38E-08), and sense of spiritual connection (SC) (3.28 v 2.50; P 6.46E-08). In our limited follow-up of 9 participants who completed half of the sessions and the long term surveys after the 12-week course, there were no detectable differences in weekly P, EWB, MD, PWB, and SC before each session. Individuals with SCD demonstrated benefits in pain, emotional sense of well-being, mental distraction, physical sense of well-being, and sense of spiritual connection immediately after seated Tai Chi exercise sessions in our pilot study. More research in a larger population would be needed to study the long-term impact of seated Tai Chi. “Every year, around the world, between 250 000 and 500 000 people suffer a spinal cord injury (SCI). The majority of spinal cord injuries are due to preventable causes such as road traffic crashes, falls or violence. People with a spinal cord injury are two to five times more likely to die prematurely than people without a spinal cord injury, with worse survival rates in low- and middle-income countries. Beyond, the devastating physical consequences of spinal cord injury are difficult psychological, behavioral, emotional, and social issues. The vast majority of patients experience chronic pain and a decreased quality of life. In addition, depression and anxiety disorders are common. Since, spinal cord injury is permanent, it is important to address the pain and psychosocial consequences of the injury that may be present throughout the lifetime. These can be changed and can help the victim engage in a happier and more productive life. Mindfulness training may help. It has shown to be effective in reducing chronic pain, treat depression and anxiety disorders, and improve quality of life following a variety of diseases. Yoga practice includes mindfulness training and also gentle physical exercise which may also be beneficial for patients with limited mobility. Hence, it would seem reasonable to examine the ability of yoga training in treating the psychological consequences of spinal cord injury. https://www.ncbi.nlm.nih.gov/pmc/articles/PMC5422575/, Curtis and colleagues recruited adults with injuries at a variety of levels of the spinal cord and randomly assigned them to receive either 6 weeks of 50-minute sessions twice a week of seated Iyengar yoga training or a wait-list control. Following the initial 6 weeks the control group also received the yoga training. They were measured before and after training for psychological inflexibility and experiential avoidance, anxiety, depression, self-efficacy, post-traumatic growth, resilience, self-compassion, mindfulness, pain, and pain catastrophizing. They found that the 6-week yoga training produced significant decreases in depression and increases in self-compassion. There were also significant increases in overall mindfulness, in particular observing and non-reactivity. These findings were true regardless of whether the yoga condition was compared to the control condition or whether the scores before treatment were compared to those after treatment. There is a need for a better controlled randomized clinical trial and longer treatment and follow-up periods. But, the present results support the idea that yoga practice is a safe and effective treatment for the psychological consequences of spinal cord injury. These results are suggestive that yoga practice improves the patients’ psychological ability to accept and cope with their situation. The increased self-compassion suggests that the patients become better able to look at their situation with warmth and non-judgement, accepting it and themselves as they are. The decreased depression suggests that the patients become better able to accept their situation and control their emotional reactions. Finally, the increases in mindfulness, suggest that they become better at mindfully observing their immediate situation and not to evaluate it, but accept it as it is. All of these benefits suggest that yoga practice can be successfully implemented with patients with spinal cord injuries, producing improvements in their psychological well-being. So, Improve the Psychological Condition of Patients with Spinal Cord Injury with Mindfulness. The purpose of this randomized controlled trial was to evaluate the effects of a specialized yoga program for individuals with a spinal cord injury (SCI) on pain, psychological, and mindfulness variables. Participants with SCI (n=23) were outpatients or community members affiliated with a rehabilitation hospital. Participants were randomized to an Iyengar yoga (IY; n=11) group or to a 6-week wait-list control (WLC; n=12) group. The IY group participated in a twice-weekly 6-week seated IY program; the WLC group participated in the same yoga program, after the IY group’s yoga program had ended. Pain, psychological, and mindfulness measures were collected at two time points for both groups (within 1–2 weeks before and after program 1 and at a third time point for the WLC group (within 1 week after program 2). Linear mixed-effect growth models were conducted to evaluate the main effects of group at T2 (postintervention), controlling for T1 (preintervention) scores. T2 depression scores were lower (F1,18=6.1, P<0.05) and T2 self-compassion scores higher (F1,18=6.57, P< 0.05) in the IY group compared to the WLC group. To increase sample size and power, the two groups were combined and analyzed across time by comparing pre- and postintervention scores. Main effects of time were found for depression scores, (F1,14.83=6.62, P<0.05), self-compassion, (F1,16.6=4.49, P<0.05), mindfulness (F1,16.79=5.42, P<0.05), mindful observing (F1,19.82=5.06, P<0.05), and mindful nonreactivity, (F1,16.53=4.92, P<0.05), all showing improvement after the intervention. The results indicated that a specialized 6-week yoga intervention reduced depressive symptoms and increased self-compassion in individuals with SCI, and may also have fostered greater mindfulness.